I have an iOS App MY-App that uses my own framework MY-Framework . Both are written in swift . The app only handles authentication of the user and sends an access to MY Framework . MY-Framework then handles the entire screen flow and business logic. The goal is to distribute MY-Framework to customers to use it in their apps. For a while I used cocoa pods to add GoogleMaps to F F ]. everything worked fine. So far so good, but when I built I got the link error with lottie . My solution was to explicitly add Lottie .framework from the Pods project to my framework linked framework . Screenshot from my Develop.xcworkspace open. know this I'm stuck. what I don't understand is why only lottie have this problem, i had no hoops to jump to use GoogleMaps . 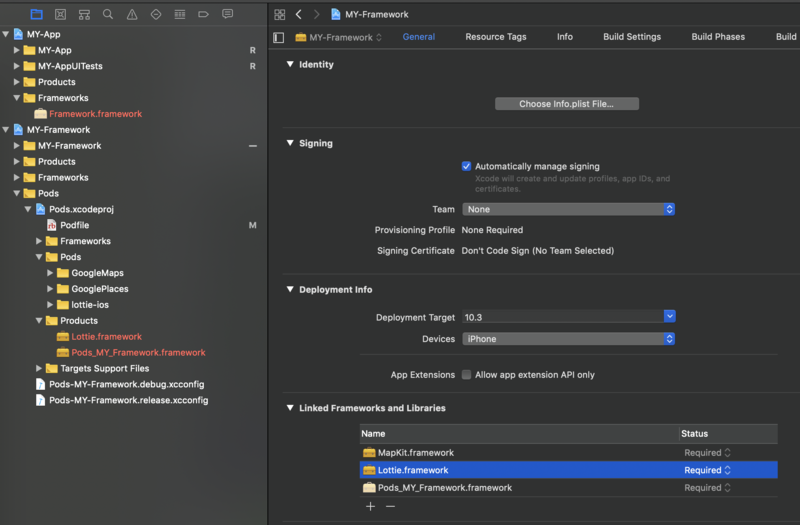 how do I use lottie-ios ] cocoalod in such a way that it is completely contained in MY-Framework so when I share it with a customer, they can just drop it into the App and not worry about any addictions?